Clarification, a hunting shotgun for dangerous game. 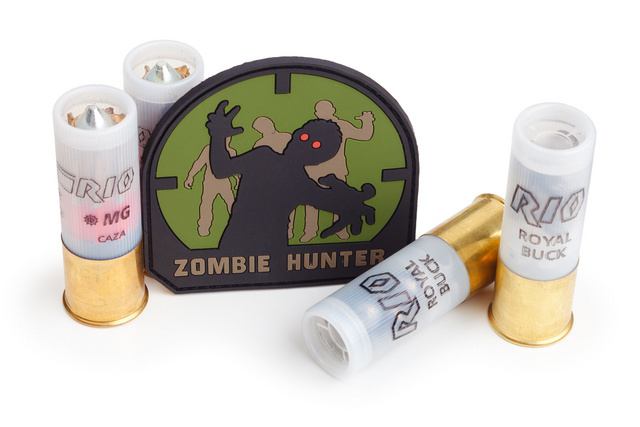 A wild boar might kill you, but only zombies can turn you undead with one bite. As an additional plus, the gun can be carried easily with one hand. The other arm would come in handy for putting around the romantic interest as you ride off into the sunrise after making your neighborhood safe from the zombies. 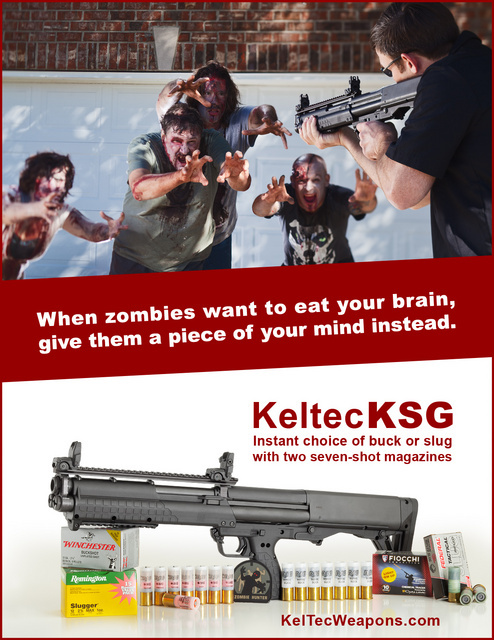 Being a pump, KSG can also handle less lethal riot control munitions…just in case you’d rather steer the zombie hordes towards the government offices than kill them. Zombie make-up by Tirzah Julius. This entry was posted in ammunition, hunting, self-defense, shotgun, weapon and tagged 12ga, bullpup, keltec, KSG, zombie. Bookmark the permalink. 13 Responses to Keltec KSG, a fine hunting shotgun. Is Larry Correia on your fan list? If not, poke him on FB and I _hope_ you’ve read his “Monster Hunter…” series. I think you can probably score a mention for this critter in the next volume. Larry is a friend in real life, but I’d be happy if you bring this to his attention anyway. Owne needs one of these. Didn’t he break the “Abomination ” in the last book? This would be a worthy successor. Wow. That shot turned out really well, Oleg. I love what you did with the image. Олег! Прошу прощения за оффтопик, подскажи пожалуйста – меня очень заинтересовал этот экземпляр ружья от Келтека, но в окрестных магазинах таковой отстутсвует, и под заказ они привезти его не могут якобы. Я же не так давно перебрался во нормальное с оружейной точки зрения место – во Флориду, и пока не в курсе, как тут все работает. Реально через интернет его заказать? Как это обычно происходит все технически? KSG is made in Florida but it hasn’t been released for retail yet. It should become available later this year. Keltec sells to distributors, so gun stores ought to order from them. The KSG also has good accuracy with slugs- critical when you need a head shot the first time lest your family be turned undead. Good to go w/ 12ga w/ #4shot for rampart defense? 9- .25 cal. pellets at 22LR velocity. The KSG always looks tempting. Oleg, just want to help with your Americanization. Generally one rides off into the “sunset” rather than the sunrise. I thoroughly enjoy your work. I know…but I wrote “sunrise” because zombies are largely nocturnal and sunrise coincides with the reduction of danger. Не твои там фотографии случайно?